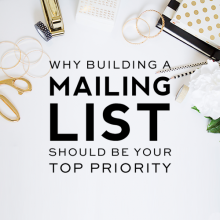 Now that you understand how important having a mailing list is (part 1) and you’ve learned how to set up a mailing list (part 2), let’s dive in and talk today about how to dramatically build your list of subscribers and target your dream audience in part 3 of our mailing list series! We absolutely love helping people grow and better their blogs! Hopefully you’ve already gathered that, but if not, this post is sure to prove that to you because it is packed with several surefire steps to increased traffic and growth! Now, you have to remember that we’ve only been at building our mailing list for about six months now, so it’s safe to say we still have much to learn, but we have done some key things that have helped us grow our list so exponentially–from 0 to 10,000+ subscribers–in such a short period of time. This month we even broke a personal record and signed up 127 new subscribers in a single day! It was exciting and we want you to be able to feel the same type of excitement we’ve felt as you work to grow your list too! Are you really ready to learn how to build a killer email list that will dramatically boost your blog traffic and sales? 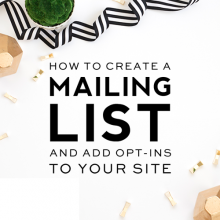 An opt-in incentive is an absolute must have if you want to build your email list fast. People are not going to want to subscribe to your newsletter unless you give them a good reason to. Giving your subscribers an incentive like a free download, printable, video, eBook, etc. is one of the best ways to grow your mailing list fast! But you can’t just offer any run-of-the-mill thing. Think about who your dream audience is and then offer something that would be irresistible to that target audience. You don’t want any Joe Blow off the street to be subscribing to your mailing list. 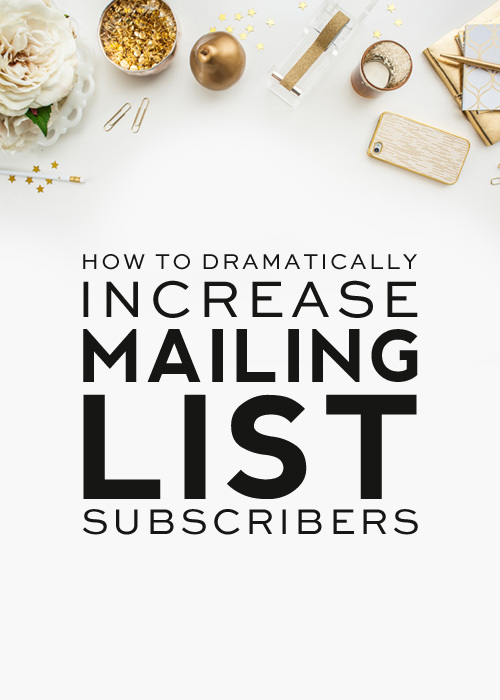 You want your subscriber list to only consist of people that actually have the potential of turning into frequent readers and/or paying customers—people that are actually interested in what you have to offer. Your opt-in incentive is key to attracting your dream list of subscribers, so really spend time developing a freebie that is perfectly related to what you offer. If you offer an unrelated opt-in incentive, you are going to attract an unrelated audience that will most likely click the “unsubscribe” button as soon as they receive your first email. That’s definitely not what you want. 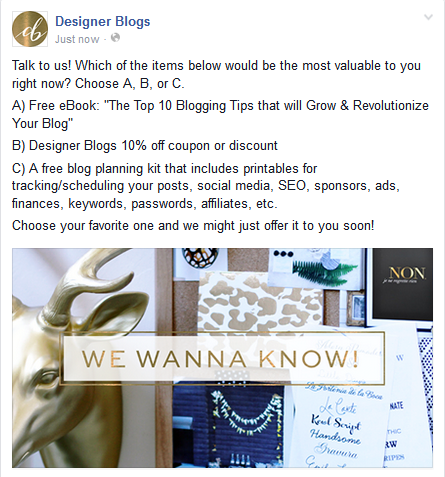 So how do you know what the perfect opt-in incentive is for your site? The overwhelming response we received from readers was that they wanted a well-designed, very comprehensive blog planner. 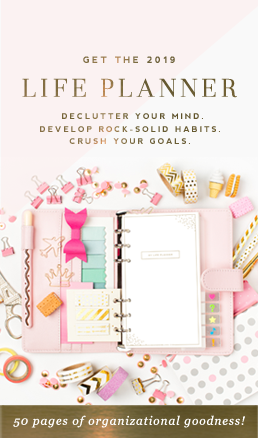 So we got busy and created the boss of all blog planners that could be used as our opt-in incentive. We poured every ounce of our heart and talent into this blog planner because we knew it would be reflective of the quality of services and products our subscribers could expect from us. Make your incentive top-notch. Make it relevant. Make it irresistible! Once you’ve created your irresistible incentive, you’ll need to create a way for your subscribers to automatically receive it once they opt-in. The Double Opt-In For Download (DIOFD) Plugin for WordPress is a great plugin that makes this effortless and easy. The premium version allows you to link the plugin to your mailing list in MailChimp or elsewhere so you can keep all of your subscribers perfectly in sync. They do such a stellar job explaining how to set up this plugin over at DIOFD, that we’ll just let you hop on over there for the instructions. Popover style: displays a popup opt-in window on your site. You can set it to pop up as soon as someone lands on your site or set up a delay so it only pops up after a reader has been on your site a certain amount of time. Sumo is a popular plugin for this. Top bar pop-up: this pins the email signup form to a colored bar across the top of every page. Many Contacts is a good plugin for this. Scroll Triggered pop-up: designed to get the attention of visitors who have engaged in your site by scrolling down. Dreamgrow Scroll Triggered Box is a popular plugin for this. Your email opt-in box needs to be placed at the very top of your sidebar for maximum exposure and engagement. Having it even just partially down on your sidebar will cost you valuable subscribers, so keep it smack dab, right there at the top. If you have a website, you want to treat your home page like an email capture page. Place a big call-to-action button or opt-in form front and center on your home page like we did to tempt and entice your visitors to sign up for your newsletter. If your blog page is your sites front page, then adding one of the pop-up options above is a good home page opt-in alternative. This is a great way to convert visitors who have stumbled over to one of your posts from Pinterest or elsewhere. If someone makes it to the end of your post, it means they clearly love your content and so why not ask them to opt-in right then and there when they are feeling great about your work? PopupAlly is a great plugin for this. 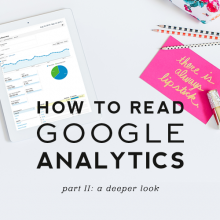 If you have Google Analytics installed you’ll probably notice that your about page is one of the most popular pages on your site. So why not take advantage of the traffic going there by adding an opt-in? After reading all about you, your visitors will naturally be head-over-heals in love with you, so why not ask them to opt-in while they are still in that prime early love phase? Ooh-la-la! 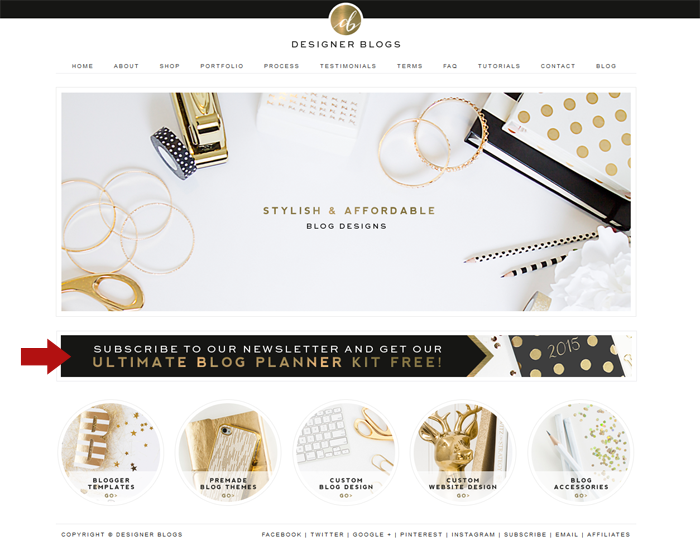 Here at Designer Blogs we love all of the above options but we don’t use them all. Here’s why: we only use the ones we’ve found work best for our particular niche. What works for some, might not work for others. So experiment with each of these options and find what creates the highest conversions for your particular niche. Last, but certainly not least, is the importance of creating killer content. You might have oodles and oodles of subscribers, but if your content is growing stale and you don’t produce anything to keep your subscribers interested, they will quickly start heading for the hills. Don’t let this happen! Amazing content is what will attract people to your site and amazing content is what will motivate them to stick around because it will be the foundation of your regular newsletters, so make it good! Have you enjoyed this 3-part mailing list series? Would you like future series? If so, let us know what topics are of interest to you! I read through the 3 steps about creating mail lists. This last piece has sort of dampened my enthusiasm.. I just created my blog, a month ago, same thing with Instagram.. The whole concept is new..I don’t know what to offer my future readers to enroll them at this point. I write about fashion tips and trends..My focus is to write quality content at the moment..But I realize I will have to think about this seriously. Thank you , you are an eye opener!!! Thank you for this useful tips. This is one of the hardest thing I want to improve on my blog. Absolutely LOVE your “Wealth of information” website! Thank you so much for providing quality content. I just started my blog and trying to learn as much as I can. Yours is the best, well organized site that I have found so far. Only one observation, can you make the linkable text stand out more, gray on gray is difficult to see. Thanks for your feedback. We’ve adjusted the color of our linkable text so it is hopefully easier to see now. Let us know what you think! You gave me a lot things to think about – I will start trying a few of your suggestions, as growing the subscriber list is our goal for this month. This step only talks of WordPress. What are the options available for Blogger? 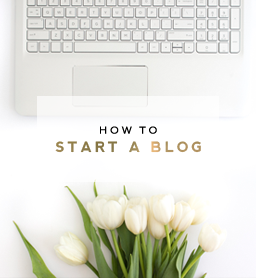 This is a very useful series and has clarified a lot of issues with setting up my blog. Thanks! I also looked for some tips on your site for getting my blogpost to look classy, in terms of alignment and sentence endings flowing to the next line. Please give some solutions to these problems too. Thanks again. Thanks for advice Savita! We will try to create more Blogger related posts in the future too.